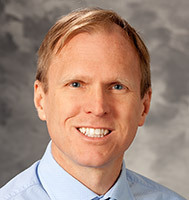 Mark Beamsley, MD, MS, is the integrated block leader for Chronic and Preventive Care, a new Phase 2 course in the SMPH ForWard Curriculum. DFMCH faculty, staff and colleagues were instrumental in rolling out the course, which blends clinical training in chronic disease management and community health experiences. In January 2018, the University of Wisconsin School of Medicine and Public Health (UW SMPH) rolled out “Chronic and Preventive Care (CPC),” one of four Phase 2 courses in its new ForWard curriculum. Led by integrated block leader Mark Beamsley, MD, MS, a UW Department of Family Medicine and Community Health (DFMCH) clinical associate professor, with support from numerous faculty and staff colleagues, the 12-week course blends clinical training in chronic disease management and community health immersion experiences. Community health engagement and health advocacy projects in partnership with the statewide Area Health Education Centers system (one half-day per week). The biggest difference is that the new course integrates medical specialties to highlight common themes and system-level approaches to chronic disease management. Student rotations are now also coordinated systematically across all participating clinics, instead of with individual faculty. 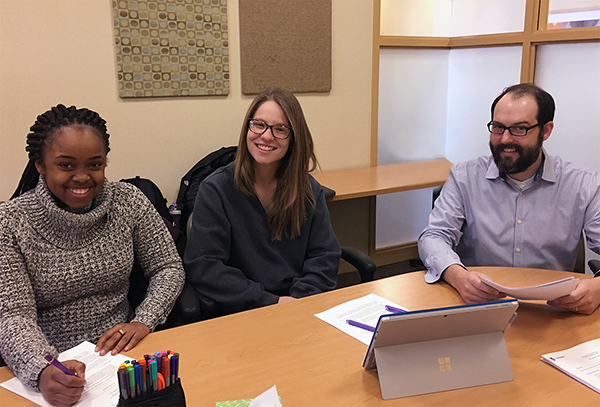 Above, second-year SMPH students India Anderson-Carter and Bailee Stark with James Bigham, MD, MPH, at a small-group learning session at the Odana Atrium clinic. In addition, student community health engagement is based on a team-based, longitudinal model, instead of individual student projects during one block of the PCC. And because Phase 2 of the new SMPH curriculum starts halfway through the second year, students get this exposure earlier than before. The CPC course is also the only Phase 2 course that’s entirely outpatient based, giving students a unique opportunity to learn how different clinicians, health systems and communities work together to promote health. The first cohort of students to have completed the course shared positive feedback about both the course structure and the faculty with whom they worked. And although rolling out a new course is a substantial organizational effort for faculty and staff, Dr. Beamsley is grateful to everyone at the DFMCH and beyond for making it go as smoothly as possible.